Selling your Beach Condo or Home? The Finest Homes Deserve the Finest Marketing! The Beaches Are My Specialty; I live, work and play here. With 40 years of selling luxury beach homes & condos, I've fine-tuned a robust selling strategy that emphasizes high-end marketing, professional photography, drone photography, and elegantly designed marketing pieces. My online team uses digital marketing to reach buyers & sellers using social media, blogging, and other outlets. Your home will be marketed digitally in "Wall Street Journal", "The Robb Report", "The New York Times", "Mansions Global"... and more! 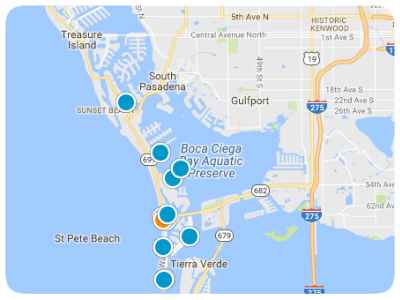 Selling your beach condo or waterfront home? Why use Gloria Doiron & her beach team to represent you in the home selling process? Experienced: We have years of beach real estate experience; from selling million dollar waterfront estates to income producing beach front condos, I've got the experience and resources to get your home sold! Check out the client testimonials. Connected: Full-time agent in the local real estate community with a vast network of buyers, sellers and vetted vendors. Exposure: Professional photos & videos. Local, state and global marketing using digital social media marketing to promote your home to 1000s of home buyers. Ask for my marketing guide: " 201 things I do to sell your home." Knowledgeable: Expert with in-depth area knowledge. Florida native and local resident realtor in the St Pete Beach area. The first time we meet, we will discuss what your selling needs. This is a good time to ask questions, and I will give you an idea of what to expect during the selling process. We will discuss preliminary ideas for pricing and house preparations. I will provide you with a complete market analysis indicating how homes are selling in your area. Understanding where buyers come from allows me to market your property competitively. Creating excitement in the marketplace through consistent and aggressive marketing efforts and integrating online and offline efforts is key to a successful sale. My maximum exposure marketing plan includes: Comprehensive Internet marketing through our site, The Pinellas Realtor Organization / MLS, Realtor.com, 27 different Florida MLS systems, Zillow.com, Trulia.com, Yahoo.com and dozens others. Luxury homes will receive additional marketing in The Wall Street Journal, The New York Times, Mansion Global, The Robb Report & the duPont Registry. The complexities of processing sales documents will be made very easy for you through my continuous guidance and communication. I will review all offers and terms of each offer with you and negotiate on your behalf so that you obtain the highest possible price for your home while limiting your exposure and protecting your bests interests. Once your home is in escrow I will prepare all seller required disclosures and reports, attend appraisal with recent comparables to support your sales price, and make sure all contingencies and repair requests are removed in a timely manner per the contract. Communication between us is imperative and I can assure you that you will be informed every step of the way. Congratulations, you have now sold your home! I will provide you with helpful moving hints and also be there to answer any questions. I am always available to help you should a question arise after the close of escrow and I want to ensure that you are 100% satisfied. Let's discuss how my marketing plan gets your home sold.